This kit is sold out now. But you should have a look at the new EM800 MAGILYZER. 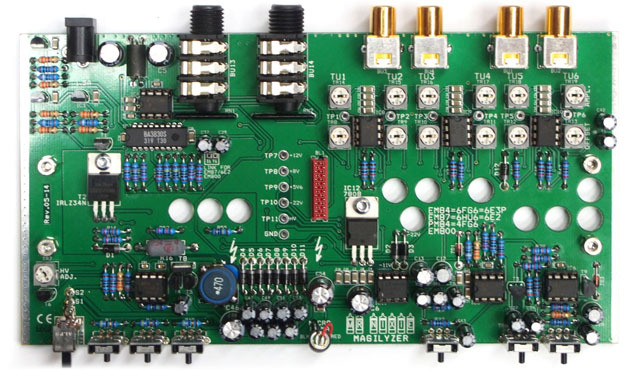 The Magilyzer is an analog audio spectrum analyzer, based around the BA3830S analyzer chip. It offers 6 selective audio bands: 63 Hz, 150 Hz, 330 Hz, 1 kHz, 3.3 kHz and 10 kHz display. 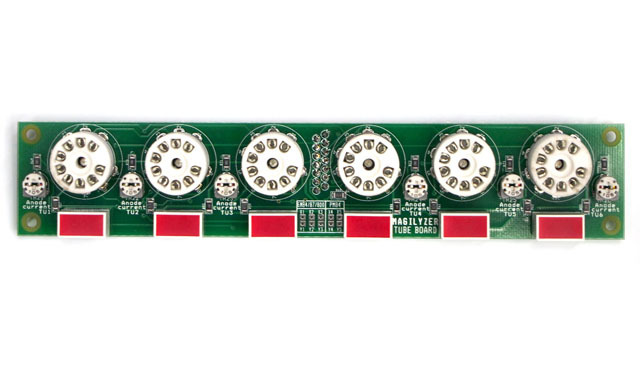 The Magilyzer operates with 6 Magic Eye tubes and offers stereo line in- and output (for easy daisy chaining the device within an existing audio path) with level control incl. selection of the displayed channel (right, both, left), build in microphone with an audio mixer to add the microphone signal to the display or for using the Magilyzer as a "stand alone" device when no audio source is connected. In addition true electronic symmetrical 2 x 1/4" stereo TRS jack inputs are added. The RGB colour and brightness tube illumination can be adjusted according with sliders to your favourite colour. 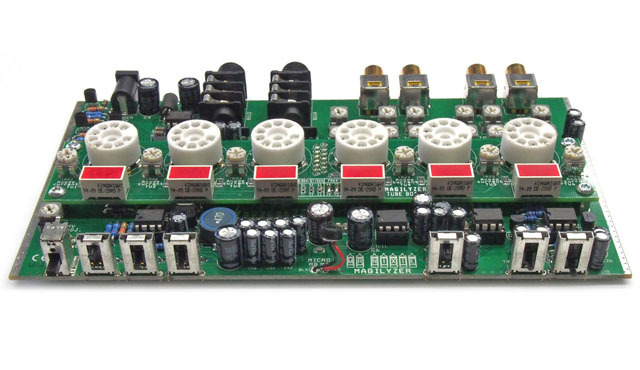 You'll get - except of the Magic Eye tubes and power supply, which are offered separate - a fully inclusive kit incl. all necessary electronical and mechanical parts (even the enclosure) to build and power-up the device within a few hours of your evening time. The Magilyzer is an analogue design and uses no processor or FFT; so the display is fully in realtime. 12 V 2 A power supply. Brightness- and colour adjustable tubes illumination. Stereo RCA in- and outputs for easy daisy chaining in an existing audio path. True electronic symmetrical 1/4 TRS inputs as an alternative; if in use the RCA inputs are disabled. Selectable audio channel (right / both / left) for display. Build-in microphone signal can be mixed. 63 Hz, 150 Hz, 330 Hz, 1 kHz, 3.3 kHz, 10 kHz spectrum level are displayed. 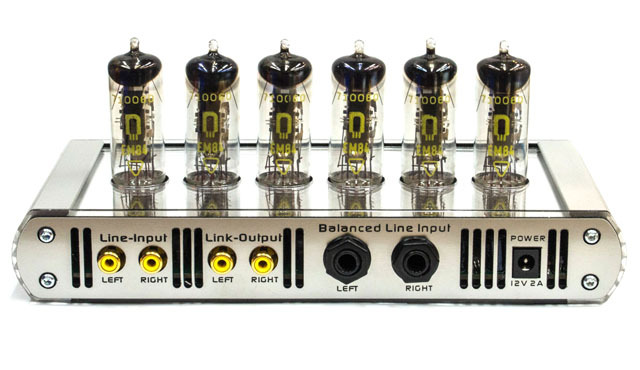 Grid bias, amplification and anode current per tube individually adjustable. Engraved frequencies on top cover are red illuminated. Solid anodized Aluminium side profiles. Mirrored acrylic top cover with engraving. 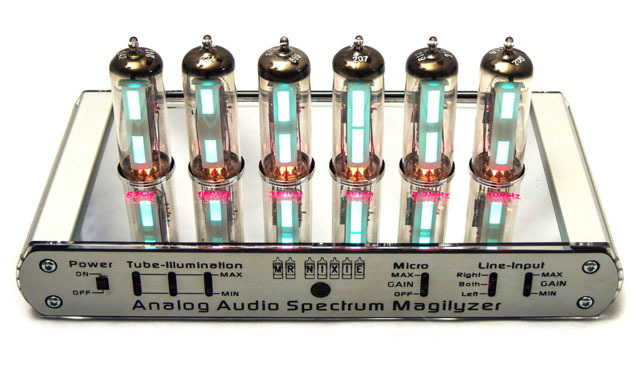 These tubes were the absolutely final development of Magic Eye tubes in 1966. They has been primary designed as a channel-no. display in the upcomming first generation of European colour TV sets. 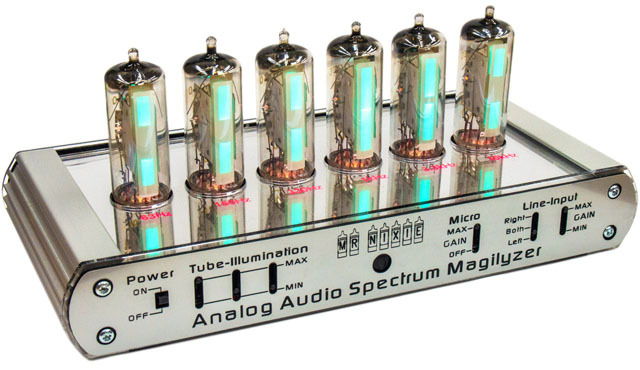 However, the time was just too late for preamplifier tubes as in the end of the 60's transistors came up to be used in the tuner stages of the TV sets and tubes become extinct (except for the picture tube for sure and their high voltage supply). This very big production batch of the TELEFUNKEN EM800 tubes were comercial never used in many devices. Radiomuseum.org for example reports only from two GRUNDIG colour TV sets from 1967 and one DYNACHORD power amplifier which has used this tube. So the EM800 have never left Germany or Europe, are very unknown in the rest of the world and has spend their last 50 years unused in German warehouses. On the other hand, these tubes has been a big improvement of the well known EM84 / EM87 or the clones 6E2 (China) and 6E3-P (Russia) as the illuminated screen started here from bottom (like a real VU meter) and not from the middle. The EM800 are still available in thousands of pcs. for a resonable price. However, the display characteristics of the EM800 tubes is linear (like a traditional mechanical VU meter) as opposed to the EM84 and their clones which have a nearly logarithmic display.